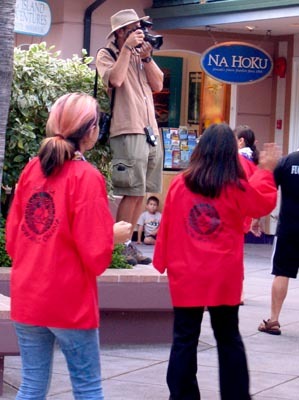 Mike shoots a freelance gig at the Kings’ Shops in Waikoloa where a cultural festival had Bon dancers circling the stage, as Taiko drummers kept the beat. After recovering from from a few shots the night before Mike was there covering it all Saturday afternoon on this blustery day. 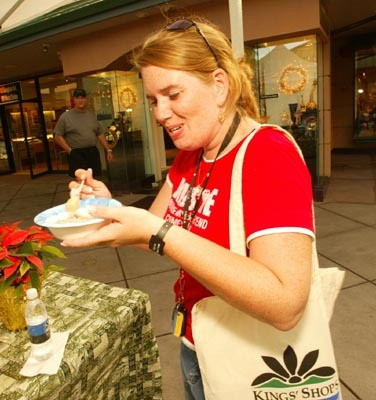 Intrepid reporter Kim has a taste test of some mystery soup at the festival. High wind warnings for the Big Island all weekend. Though the winds were strong in Puako and Kawaihae it’s not that unusual to find that kind of wind there. Over the ocean I could see choppy seas and the strong winds were actually picking up the seawater and carrying it into the air in sheets and wind devils like an upside-down rainstorm, the water was going up instead of down. It was too far out to photograph, more of a video moment anyway as any still image would look just hazy. Might have to start carrying a video camera around.